K11 Owners Group :: View topic - One of my LTs went Harley on me over the winter. 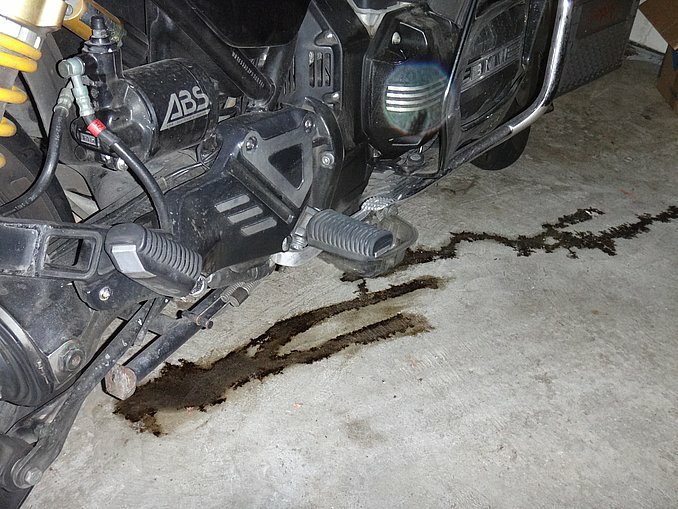 Posted: Thu Apr 11, 2019 8:37 am Post subject: One of my LTs went Harley on me over the winter. The water pump marked its territory. I moved the bike forward before taking the picture. Where it was sitting the oil stain starts right under the water pump. I put a drip pan under it until I get around to fixing it. I have a couple of used 93 water pumps from bikes I've parted in the past so I'll just be lazy and install one of those instead of doing a WP rebuild. Fingers crossed. Don't ya' just hate it when machines rebel? A month ago I put a new battery into my '92 RS. Two weeks later the new battery was totally flat. I pulled the Eastern Beaver fuse box/relay out and now all is good. WTF??? I haven't traced the problem yet but the battery is still at full charge.